Our old goat, Harriet, passed away peacefully in early February. She struggled with arthritis for the last couple of years and despite taking anti-inflammatory and pain medication, the cold during the polar vortex was too much for her to handle and we made the difficult decision to have her euthanized once it was clear she was suffering. 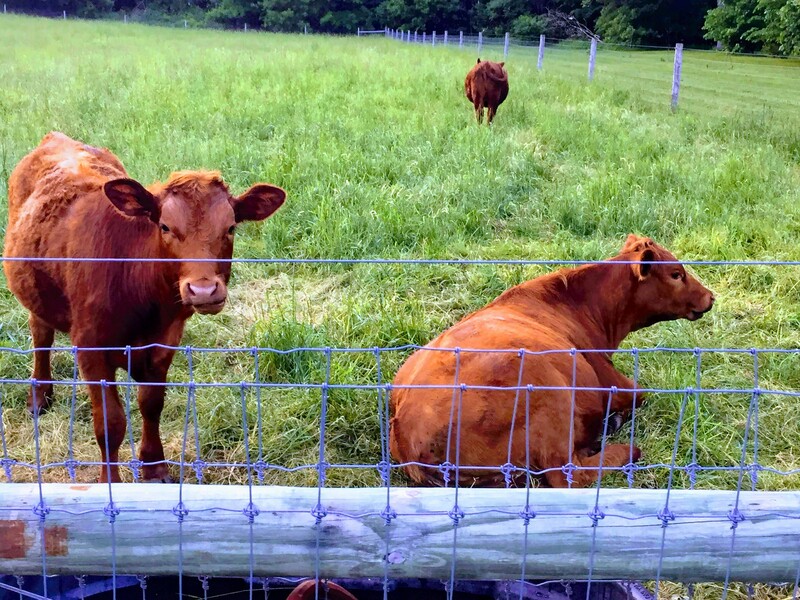 Harriet and Butterbean – one of the earliest and still one of my favorite pictures from around the farm. The average life expectancy for an angora goat is believed to be only 8 to 11 years. Harriet was at least 16 years old (ancient in angora goat years). She lost her front teeth, had her horn cut down when it was threatening to grow into her skull, and still kept ticking. Harriet after her horn removal with candlewax covering. We will miss her gentle nature in the flock and her unique color out in the pastures. Harriet out in the field. Harriet looking into the camera in her last few days. We had her cremated and plan to spread her remains around the pasture once spring arrives. As noted last time, 3 of our 4 new hens were missing, presumed dead. The hen after she survived the initial attack. We moved another hen from our flock to the chicken tractor so that the silver-spangled hamburg wouldn’t be alone. We also lined the outside of the chicken tractor with paving stones so nothing could dig right next to side and get underneath. This seemed to work as we saw no indications of any predators for several weeks. After the quarantine period, we moved the silver-spangled hamburg and the other hen into the main barn so they could safely integrate back into the flock. They were inside a portable dog pen that was lined on the outside with chicken wire with a piece wood over the top. 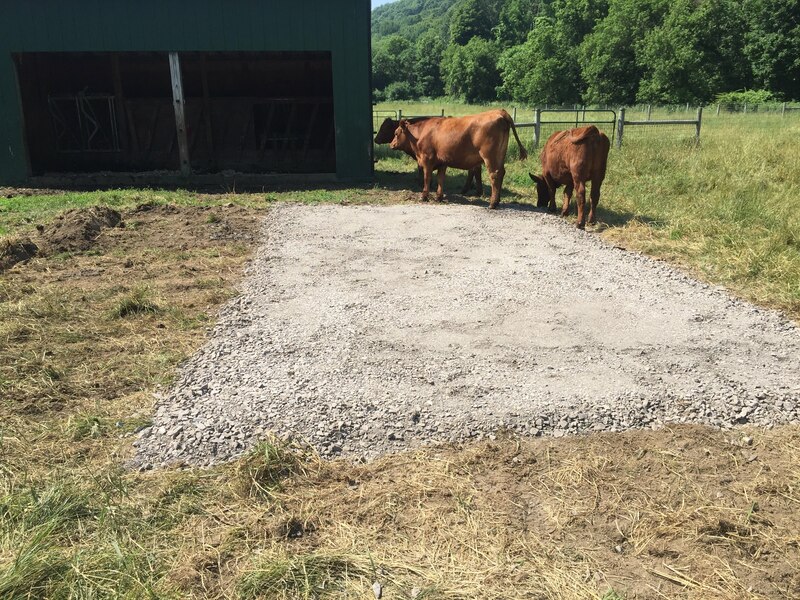 The barn has a concrete floor so the assumption was that nothing could dig underneath the pen. Last fall, consistent with past practice (see here, here and here), we picked up 4 new hens from the NY State Fair. There were 3 bantam-sized partridge cochins and 1 silver-spangled hamburg. They were all close to fully grown. The silver-spangled hamburg is a small breed, so although she wasn’t a true bantam, she was similar size to the bantam cochins. The hens in their carrier being carried to the parking lot at the NY State Fair. The cochins preferred to try to stack on top of each other while in transit. As the hens were new to our flock, we quarantined them in the moveable chicken tractor for several weeks. When quarantining the new hens, we placed the chicken tractor outside of the main fences. The 3 Bantam Partridge Cochins enjoying the chicken tractor. The chicken tractor is covered with wire mesh to both keep the chickens inside and keep predators out. As you can see in the above picture, the wire mesh is pretty small and anything that can fit through the mesh is unlikely to threaten an adult chicken. As we are well into wintry weather for the year, here are some more details about our geothermal heating system. See the earlier explanatory post about the installation process outside the house here. 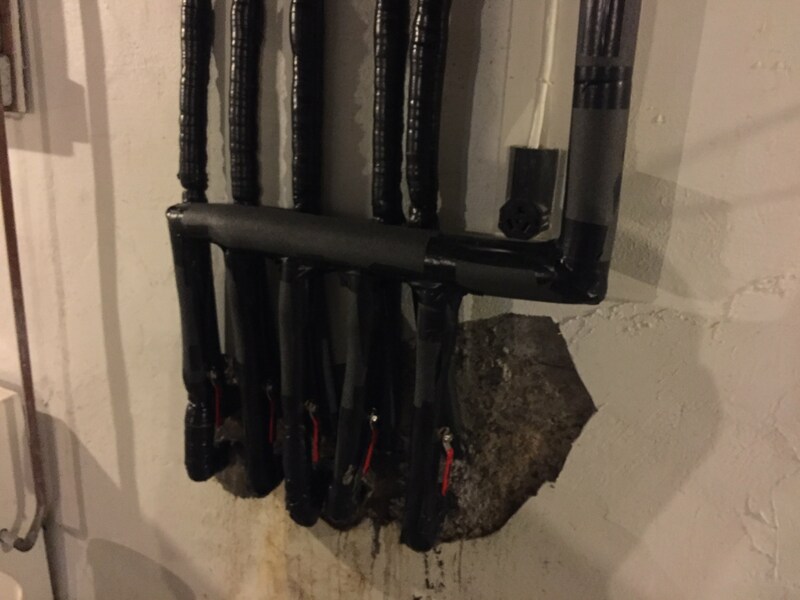 In addition to the bore holes and “moat” outside the house, there was also a bit of work inside the house for the changeover to a geothermal heating system. Following the lines from outside, the first step was creating a path for the heating loops into the house. Here is a picture of the manifold where the lines enter and exit the house. There are 5 entry lines and 5 exit lines. This covers 5 different heating loops. Each of the 5 heating loops has the cold water leave the house, travel to the bore holes and go down and back up two 75-foot bore holes per loop to absorb heat from the ground and then travel back into the house. 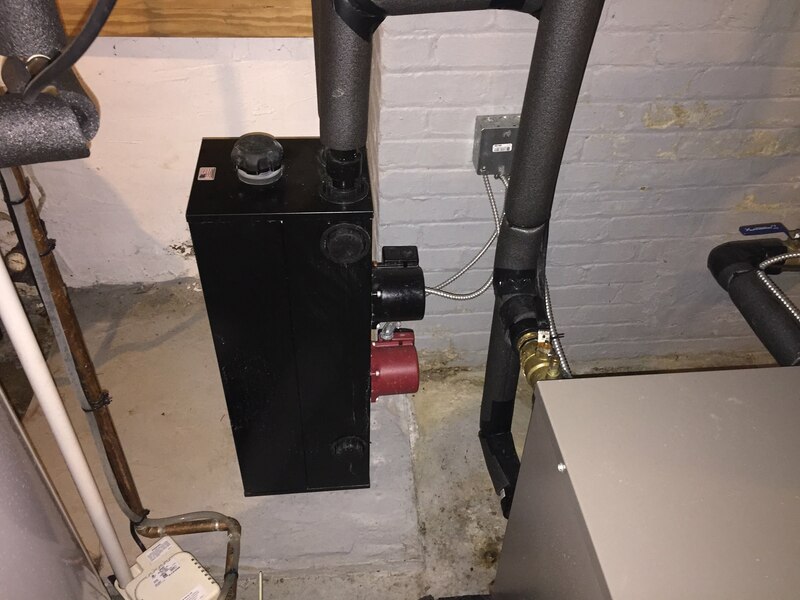 This is the pump unit that circulates the water from inside the house, through the heating loops outside and back into the house to the heat pump. 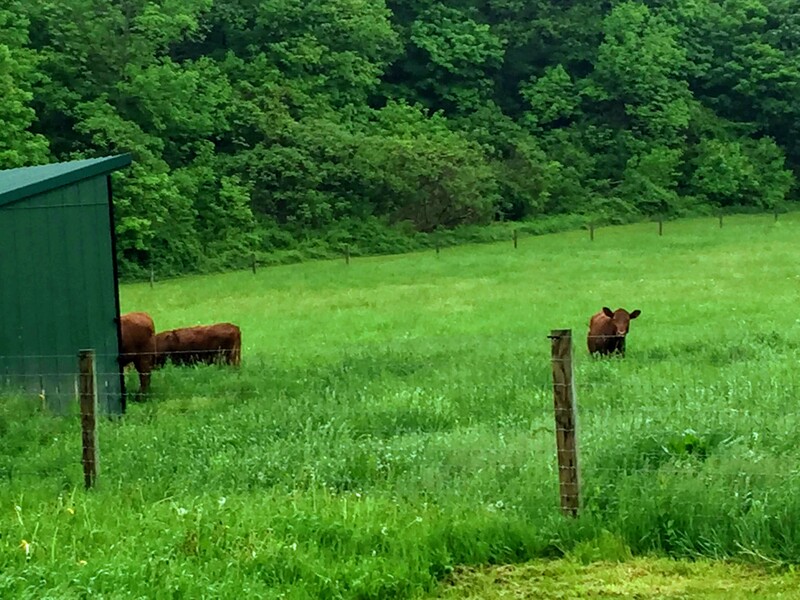 Last month, a local county agricultural council sponsored their annual farm fest, where a number of local farms are open on a weekend day for free tours / open house. It just so happens that one of the farms open for tours was only ~3 miles away so we decided to stop by. 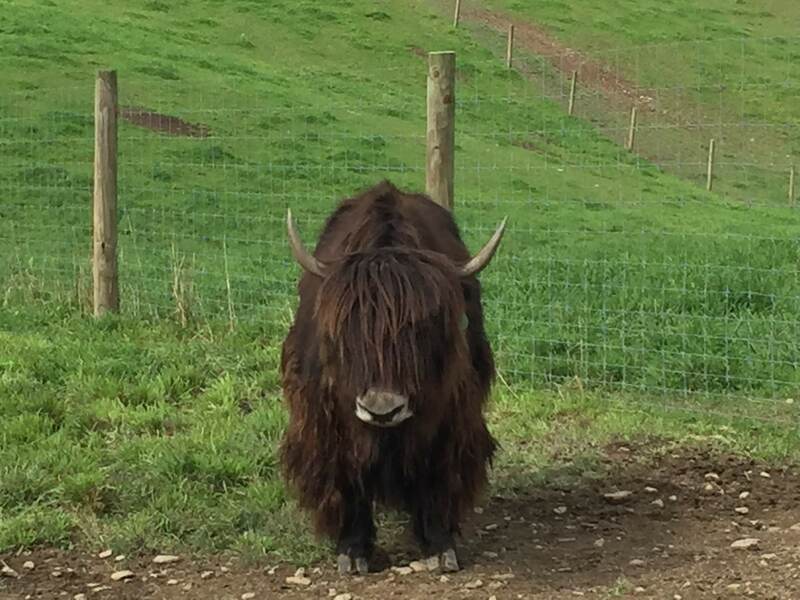 Although only a few miles away, the farm isn’t directly visible from the road, so we had no idea that they raise… yaks! 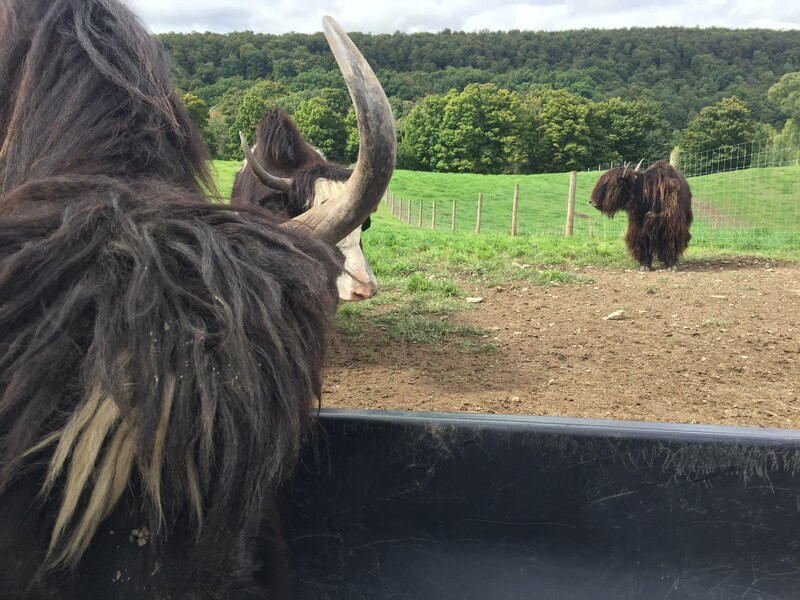 We learned that yaks are a triple threat – they are raised for milk, meat and fiber. The farm was selling yak sliders and yak yarn and fiber products during the open house. According to the farmer, yaks are smaller than typical beef and dairy cows – the adult females are typically only 500 to 600 pounds. Adult male yaks (domesticated) can weigh in at 900 – 1,200 pounds. 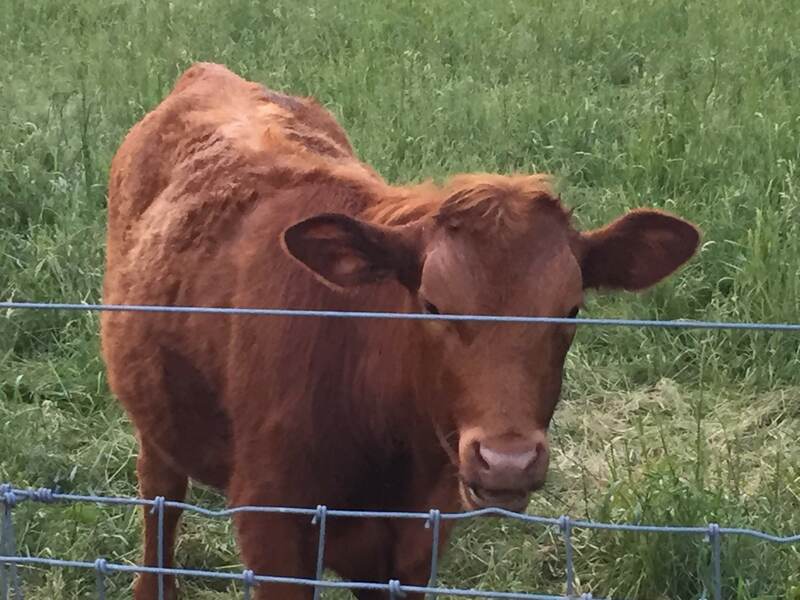 For reference, typical beef cattle bulls can reach closer to 2,000-3,000 pounds (but are often slaughtered younger so are usually seen at lower than full weight). Here is a close-up shot so you can see their shaggy fur coat. Their fiber is used to make yarn and then into whatever product from there. The farm was selling knit yak products such as winter hats. An imperial yak (I think). 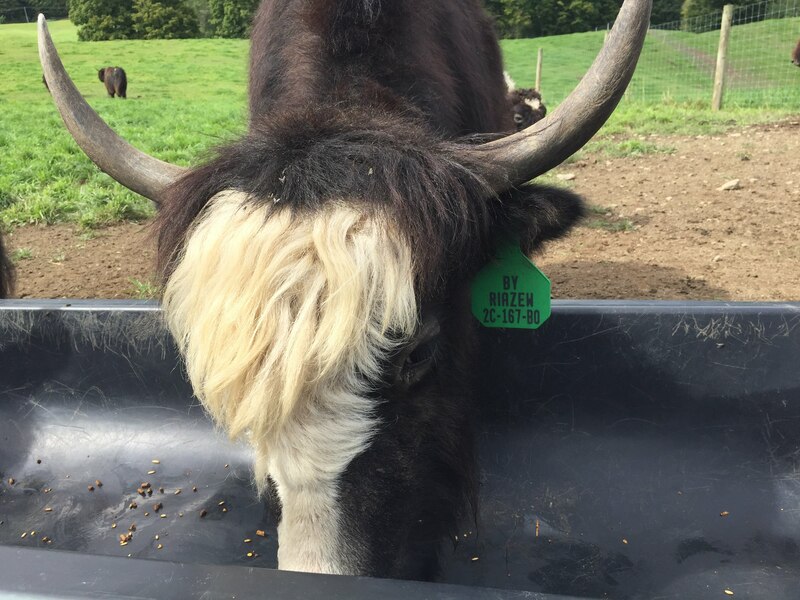 Yaks come in a variety of color patterns. A black yak is called an imperial yak. A yak that is white and black is called a royal yak. There are also somewhat rare golden yaks that are all light brownish in color. With the expanded flock, we needed to make sure all of the goats (especially the kids) could get out of the weather all summer, no matter which pasture they were in. 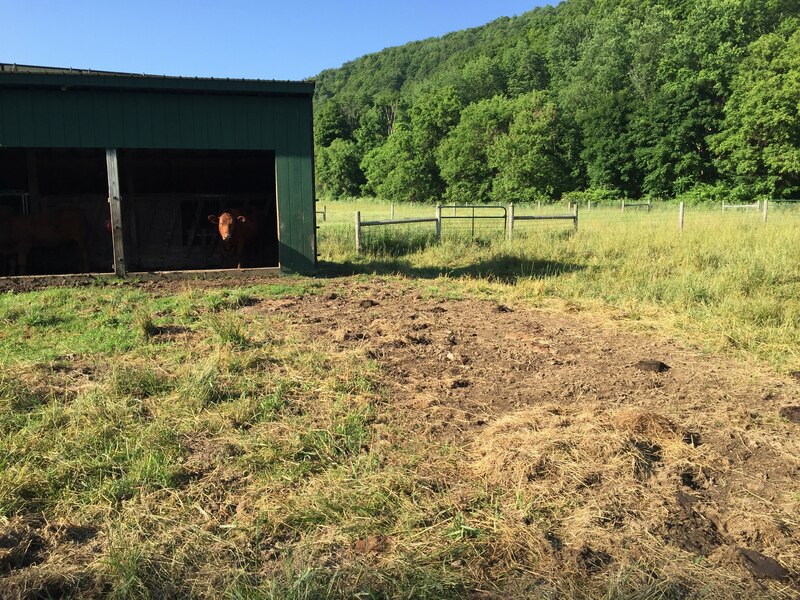 While we already have the barn in one of the large pastures, the other large pasture only had a single run-in shed. While the goats could all fit in our original run-in shed if they stood fairly close together, in practice they would fight a bit and push some of the goats out of the shed at least some of the time, even before we added Treat and her 2 kids to the flock. 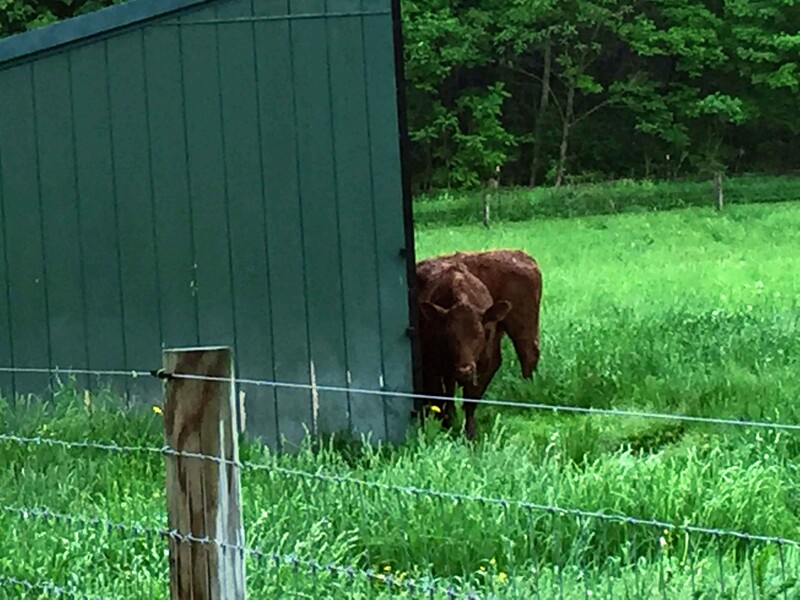 So, we decided to add a second run-in shed so they could all be under cover at the same time without pushing each other around. We wanted to put it relatively close to the current shed so all of the goats could be near each other. We ordered a custom built shed from a local Amish building group. First, we had to clear a patch of grass where the shed would go. I used the loader bucket on the tractor to clear out a dirt patch slightly bigger than the base of the shed. Clearing the grass for a spot for the new shed. After clearing a spot, we had a load of gravel delivered to create a good base for the shed that would allow good drainage. With the gravel leveled and compacted, we were ready for delivery. Tessi and Tori, our 2 goat kids, needed a series of vaccines at ages 1-month and 3-months. Our local vet did a on-site farm visit for the first round of vaccines at 1-month old but all of her farm-call openings were booked at the time for the 3-month shot. So, we took them to the vet’s office in the nearby town instead. It is only a 10 minute drive away. As the kids hadn’t been weaned from their mother yet, we took their mom along as well to try to limit the amount of screaming and crying. Treat, Tessi and Tori visit the vet. They were mostly curious to be in a new area with new things to chew on and new rooms to explore. Treat looking at the exam table. As long time readers already know, we bought 2 goat kids and their mom from another farm earlier this year. But, it was a harder selection process than you might think. There were a lot of cute goat kids running around – it was very hard to pick! Many of the smaller goat kids were wearing sweaters to stay warm as it was unseasonably cold in mid-April this year. More goat kids in sweaters. In addition to the ones in sweaters, many of the slightly larger kids were running around the barn, chasing each other and getting into all sorts of typical goat trouble. A bunch of goat kids. Earlier this year in the spring I took a hike up our mountain to clean up any trash or debris that had blown onto our property over the winter. I collected a handful of empty soda bottles (probably originally left by hunters on neighboring properties), some plastic bags, and 2 deflated balloons. There was a deer skeleton just onto our property. It may have died naturally over the cold winter, or it may have been shot and injured by a hunter and the hunter couldn’t track it. It appears to be the skeleton of a young buck – the antlers only have a few points. 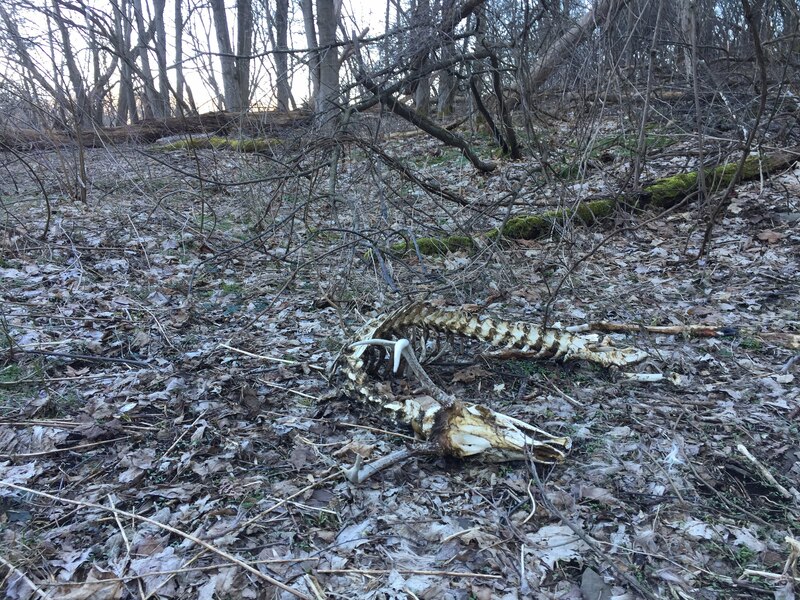 A deer skeleton in the woods. 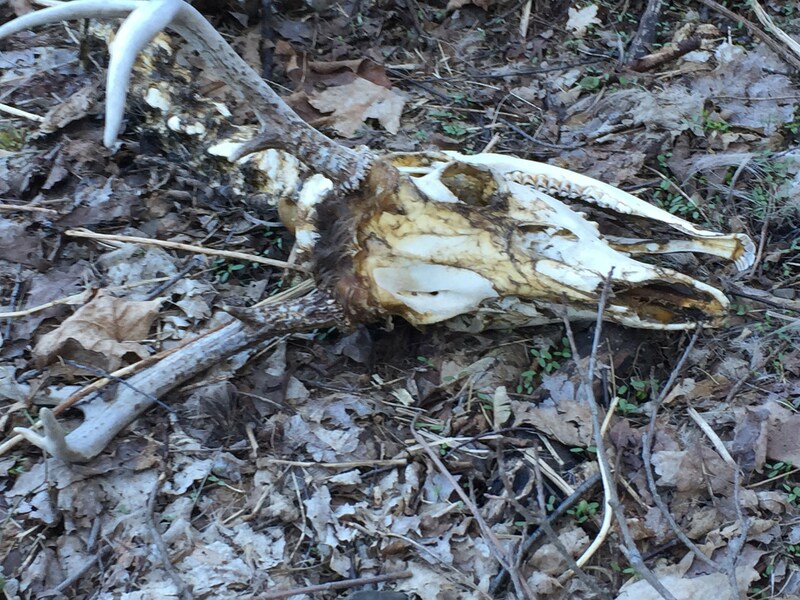 Deer skull with antlers still attached.